Skier Mike Stoner finds his own Zen moment in Wasatch powder. I’ll readily admit, though, I was already aware of that before I even dove into this whole Zen/skiing mind-screw. I consider myself to be somewhat spiritual, but not terribly religious. Raised a twice-per-year Catholic — that’s Christmas and Easter — I knew nothing of Zen teachings. I was skeptical, but Ski to Live also offered the chance to ski with and learn from Ulmer, one of the most prominent figures in the history of women’s big mountain skiing, so I swallowed my skepticism and signed up for the four-day clinic at Utah’s Snowbird Ski & Summer Resort. What did I have to lose? Perhaps I’d come away a better person, and a better skier to boot. Starting her skiing career as a mogul specialist on the U.S. Ski Team in the early 1990s, Ulmer quickly broke that mold and exploded onto the professional freeskiing scene to win countless big mountain titles and appear in numerous ski films. 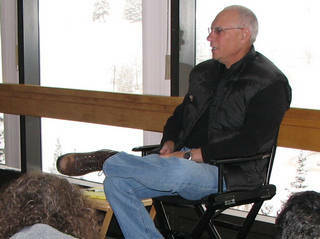 In 2003, however, after meeting Roshi, who in 1999 pioneered the “Big Mind” technique to accelerate Zen teaching in a modern environment, Ulmer has created what is undoubtedly the most unique ski clinic in the industry. In person, Kristen Ulmer is the antithesis of her brash big-mountain persona. In person, Ulmer is the antithesis of her brash big-mountain persona. Nearly sidelined from skiing altogether by a history of debilitating knee injuries, she’s surprisingly vulnerable and humble. Ulmer awoke one day after a decade and a half of living to ski and realized that she needed something more. For the first time she understood that it was her inner spirituality that spawned her professional skiing career and not the other way around. Ulmer started hitting the motivational speaker and private coaching circuit and founded Ski to Live, named as a 180-degree play on words from the slogan “live to ski.” It’s all about skiing as spiritual practice, or spiritual practice as skiing. It was a cold, dark and snowy early January night outside, but warm and bright indoors as I filled my plate with mini-quiche, fresh fruit and other assorted gastronomic goodies in The Atrium, the Cliff Lodge’s ground-floor casual dining venue. A glass of chardonnay from the bar helped to calm my nerves as I sat at a large round table with a half dozen strangers who had traveled from across the country for Zen and skiing enlightenment. My nerves, though, were unfounded. Coming from a variety of backgrounds, a variety of professions and a variety of skiing experiences, everyone was nonetheless uniformly warm and friendly. I suppose that ought to be expected from a group willing to shell out over $2,000 to learn about both skiing and life in a holistic environment. A commercial banker, a professional photographer and Alaskan heli-ski guide, a police officer, an Internet pioneer…even a father with his two college-age kids. Scattered amongst the group were the three of Snowbird’s best ski instructors who would assist Ulmer with the on-snow sessions, and of course, the ski queen herself. Before long, Ulmer gained the group’s attention and introduced the clinic. One by one, each person in the room addressed the group to share what they hoped to gain from the sessions. Some focused on improving their skiing, but all referenced in one manner or another the personal growth they planned to take home from Utah. Some combined the two, confident that Big Mind would help them overcome fear on the mountain and tentative skiing. Several participants were embarking upon a return voyage, and only hinted at what to expect from the après-ski sessions with Roshi. I struggled to gain understanding, but was strangely comforted by a belief that all would make sense before long as I ventured into the blizzard to bed down for the night. No matter what, the morning would bring a big day. That big day started at 6:00 a.m. as I rolled out of bed and struggled to shake the cobwebs from my brain as I stumbled into the Cliff Spa’s yoga room with my lifeblood cup of coffee in one hand and a yoga mat and towel in the other. I heretofore wouldn’t know a yoga mat from down dog, and I floundered helplessly as I fought to mimic the instructor’s movements. She snuck up behind me, grabbed an appendage and forced it into an unlikely position. “Gee, you’re rather stiff, aren’t you?” she asked me, somewhat rhetorically. Listen, lady…41 years of avoiding a gym like the plague will do that to a guy! I was far more in my element as we reconvened on the Tram Plaza following breakfast. Snow continued to fall on top of the 13 inches of fresh Wasatch blower piled up overnight, and I was about to receive my first ski instruction in years. We divided ourselves into three groups: those who wanted to cruise, those who wanted to charge hard all day, and those looking for a mix of both. I arrogantly plopped myself into the middle of the hard-charging group and headed up the Tram with Mike, our group’s instructor for the day, bypassing the Tram queue that stretched clear across the Plaza, filled with snow-starved Utahns who hadn’t seen a flake in the previous 10 days. 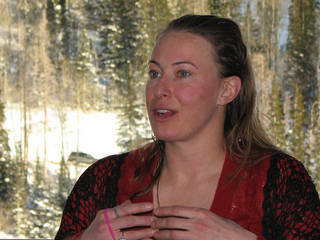 Ski to Live participant Wendy Alexander harnesses Big Mind for an exceptional run at Snowbird. Mike gauged the group’s desires, a process made easier by our frothing at the mouth as we gazed out the Tram cabin windows. This is a group that wanted to ski powder, ski it deep, and ski it hard all day. Mike delivered by seeking out every little powder pocket on the mountain as the general public devoured the more obvious lines. By leveraging his mountain knowledge, even including two hikes in a row up to the High Baldy Traverse, the group scored knee-deep fresh lines right to the final bell. 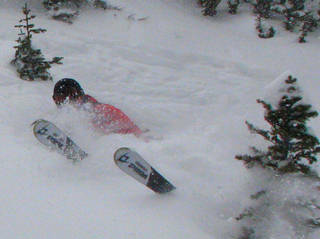 The day was long on powder and short on focused ski instruction. Mike would toss out a tidbit here and there to address a specific issue, but by and large the day was about getting the most out of the mountain on a whirlwind powder day. What I had yet to understand, though, is that Ski to Live’s on-hill instruction isn’t about focusing on angulation, hand positioning, weight centering, or other mechanics of skiing. Instead, it’s about becoming one with the mountain, focusing energy and inner strength to conquer fears and triumph in personal success by unwrapping the onion layers of skiing’s mental element. And in this respect, the day delivered in spades. One by one, each clinic participant straggled into the Cliff Spa’s rooftop hot tub as a stiff up-canyon wind swirled snow across the pool deck. Getting into the tub was the easy part – getting back out was painful as cold snow stung every bit of exposed flesh. We all wound up in the locker room to change, grab a Red Bull, and meet Zen Master Genpo Roshi. I don’t really know what I had expected, but Roshi wasn’t it. I suppose that I’d pictured a diminutive man, soft-spoken and exuding the stereotypical tranquility of a Zen scholar. Roshi, on the other hand, was tall and imposing, and his sometimes booming voice clearly commanded attention. His 63 year-old face smiled broadly when offered a beer, and he readily accepted. Born in Brooklyn, N.Y., Dennis Genpo Merzel Roshi earned a Masters Degree in Education from the University of Southern California before ordaining as a Zen monk in 1973. He was approved as a Zen Master in 1996. In 1982, Roshi began teaching Zen throughout Europe and founded the group Kanzeon Sangha, based in Salt Lake City with affiliates in France, Holland, Poland, Belgium, Germany, England and Malta. He has authored five books and several DVDs pertaining to spiritual enlightenment. He is also a cancer survivor. Zen Master Genpo Roshi introduces Ski to Live to the concept of Big Mind. Roshi’s talks focus on spirituality rather than religion, and are thus completely non-threatening to people from any spot on the religious continuum or from any religious faith. Big Mind is what Roshi calls an inner awareness of our connection to each other and our environment. Roshi’s teachings assert that we are all born with Big Mind, but during our development we trade Big Mind for small self as we begin to make distinctions and separate ourselves from the rest of the world. Dissatisfaction and anxiety develop because small self is always on the “inside” looking out at the rest of the world and feeling isolated. The Big Mind technique follows the ego’s natural place in a society populated by other emotions. One by one they’re asked to speak: the protector, the controller, the skeptic, fear, anger, the damaged self, the victim, and the vulnerable innocent child, on up through Non-seeking Mind, Big Mind and Big Heart. Roshi’s teachings prompt participants to live their life with more awareness, living it more fully. Over the course of the next three evenings, we explored deeper and deeper layers of our inner selves. Sometimes heartwarming, yet often disconcerting and troubling, the curtain shrouding my emotions and their connections to one another was gradually pulled back. My skepticism slowly dissolved and I began to appreciate my emotions, even the darker ones, for their purpose in my life. Once we let go of small self and listen to Big Mind, and let go instead of fighting and resisting, we simply address each situation as it happens. You walk out of one of Roshi’s sessions with a new sense of inner self and skiing’s place in it, as well as Big Mind’s place in skiing. One afternoon’s session employed a drill where we all breathed in our fear and breathed out the hope of ever getting rid of it. We did one on motivation, and how we would view our life of skiing upon our death bed. Ulmer always does different half-hour sessions based on the discussions of the group. 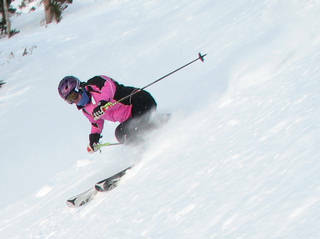 Ski diva Kristen Ulmer carves up Snowbird’s formidable Great Scott. Deep bonds were born from four days spent sharing emotional and spiritual development with the same group by night, and skiing together to discover analogies between the evening teachings and our beloved sport of skiing by day. Chairlift rides and on-hill discussions were bolstered by a new-found sense of freedom and understanding of our place in the gorgeous Wasatch Mountain environment that surrounded us. Everything came together on the final ski day when our group was joined by Ulmer. By this point, though, Ulmer was no longer her public ski deity. She had exposed her inner thoughts and emotions at each evening session as a student, not a teacher. She was human…at least until she carved broad high-speed arcs down the chalky steeps of Snowbird’s Great Scott. 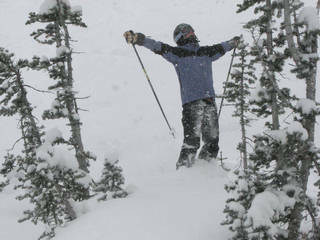 Ulmer will run Ski to Live clinics at Utah’s Alta, Park City and Snowbird ski resorts this winter. Visit www.kristenulmer.com for clinic details and registration.